Sterling silver Claddagh ring forms the kiss from X's and O's. This criss cross sterling silver Claddagh ring measures 1/4" tall from the top of the crown to the bottom of the heart and it forms an X that is associated with a kiss. This piece of sterling silver jewelry is gift boxed with the Galway Folklore that explains how to correctly wear the Irish ring along with Claddagh legend card, complements of The Irish Gift House. 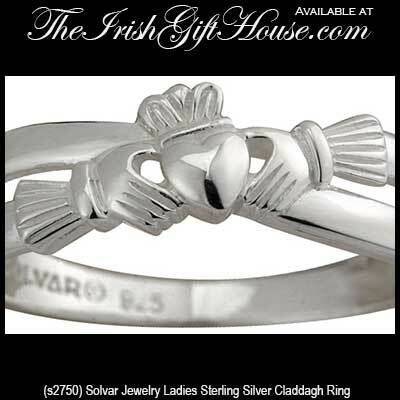 The Claddagh kiss ring is made by Solvar Jewelry in Dublin, Ireland. This sterling silver Claddagh ring is available in sizes 4 through 10, in full sizes only. Traditional sterling silver Claddagh ring is our best selling design. Small sterling silver Claddagh ring would be a good size for a child or for a women with smaller fingers. Sterling silver Claddagh ring features marcasite stones in the heart and crown. 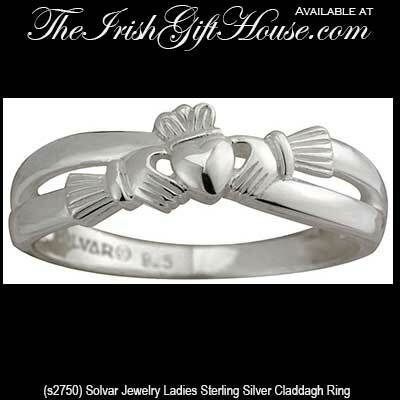 Women's sterling silver Claddagh ring is a light weight version of the classic Irish ring. Sterling silver Claddagh ring is a light weight design that would be an ideal size ring for a baby or child. Sterling silver Claddagh ring is our smallest and lightest weight design and it would be ideal for a baby or child along with women that have small hands.